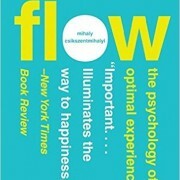 It was back in October of 2011 when I wrote my book review of Mihaly Csikszentmihalyi’s book Finding Flow. That was very early on in my process of knowledge building. In fact, I didn’t write my post “Research in the age of electrons” until February 2012. Knowledge building for me is the process described in “Research in the age of electrons” where I highlight, copy, re-highlight, and write. Finding Flow wasn’t the last reference to the flow state. When reviewing my notes I realized that I didn’t mention that Emotional Intelligence referred to flow repeatedly. However, after reading The Rise of Superman I realized I need to come back to Csikszentmihalyi’s work on flow and make sure that I really understood it. If I was going to spend my life seeking out better performance and deeper understanding, I needed to make sure that I more fully understood what the “father” of flow thought – and the place for that is his book simply titled Flow. There’s got to be a reason to seek anything and in the case of flow, it seems like the reason is happiness. I’m no stranger to looking at the topic of happiness and trying to decode its mysteries. I’ve tried Stumbling on Happiness and I’ve tried The Happiness Hypothesis. I’ve even tried Hardwiring Happiness. However, none of these books have a recipe for how to get happiness. Perhaps we’ve not come that far since Aristotle concluded that most men and women are seeking happiness. The answer to finding happiness may not be in external things. Instead the answer to finding happiness may be in how we view things. Our attitude to whatever our circumstances are seems to matter more in terms of our happiness than what is happening to us. Whether it’s the relative stability of Viktor Frankl expressed in Man’s Search for Meaning or winning the cortical lottery and having a more positive set point. However, equally interesting is that happiness can’t be pursued directly. One can’t say that they’re going to just “be happier.” Even Hardwiring Happiness admitted that there’s no front door to walk through. However, one of the things that we know about the flow state is that its residue – what you’re left with after you’ve been in a flow state is a sense of happiness. So perhaps the road to happiness is through flow. The people who are measurably the happiest are the ones that spend the most time in flow. On the outside in America we’re one of the most affluent countries on the planet. We have conveniences today that our grandparents couldn’t even dream of. Consider the mobile phone that you carry with you and how foreign it would have been to your grandparents when they were a child. If someone told your grandfather that he wouldn’t get the newspaper that he’d read anything he wanted from a screen he wouldn’t believe you. Actually you’d first have to explain what a screen is to him. So in this world of affluence why is it that we’ve got more depressed people. Why do we have so much anxiety – and most tragically so many suicides? On the one hand we have everything that we could possibly want and more and on the other hand we’re empty and devoid of happiness. Some of this can be explained away by our lack of social involvement and the fragmentation of extended families but not all of it. Bowling Alone spoke about how we’re simply not staying connected to broader groups of people. We’re not joining clubs like our parents and grandparents did. We’re not as philanthropic. We’re more self-absorbed. We’re always connected to one another but we never deeply connect with others. This started with the Industrial Revolution which shortened the life spans of the members of several generations and made people less happy in the process. We’ve reignited the same forces in the information age to drive our unhappiness. Despite our striving for material success we still have a relatively large amount of time that we can spend in leisure activities. Except for a small percentage of the population we still have the option to spend roughly a third of our time in leisure activities. However, what leisure activities you choose may lead to more or less happiness. As it turns out to be enjoying something you have to be actively engaged. Despite this all too many of us are sucked into the lure of television and are there by just passive consumers of the experiences that others have packaged for us. We can have a pleasurable experience but not really and enjoyable one without activity. There are barriers to creating enjoyment from our leisure time. As the book Demand explained, there are hassle maps between what we want to do and where we are. With leisure it could be the drive between you and the bowling alley. It might be the difficulty in lining up your schedule and the schedule of your friend for a game. The barriers no matter how small add-up and make it less likely that you’ll do something – including converting leisure to enjoyment. The television has had a strong lure since its introduction but over the years we moved from broadcast programs to rebroadcasts to video cassette recorders to digital video recorders and on-demand TV. It used to be that there were barriers to watching something interesting because it wasn’t broadcast. Cable TV lowered that barrier by streaming in much greater quantities of content to choose from. Once we could record content – and the barriers to the recording process were reduced – we can now literally watch almost anything we want at any time. This has given rise to binge watching. We’ve so effectively removed any barriers from using the TV to fill our leisure time that there’s almost no barriers left. I suppose that you have to have power and an Internet connection but reliability of both are so high that it’s quite rare that you can’t watch TV. Like a household filled with sugary and salty snacks and frozen meat we tend to snack on things that aren’t good for us. While TV can be used for education and thought provoking programs, most TV is filled with situational comedies and increasingly mock reality shows. Instead of being actively engaged in the process of learning and growing we’ve settled for the snack food equivalent of filling our time. While most of us like a sugary or salty treat (because we’re wired that way) we can’t live on them every day. Conversely, I’m the beneficiary of another set of hassles being reduced. The reading experience is much different than it was. I can find a book on Amazon.com, purchase it, and be reading something new within a minute. I don’t have to go to a store or a library or even get out of my pajamas to get the next book in a series or start to learn about something new. Reading is one of the most often described flow generating activities. The mechanics of it are good encouragement to the flow state. By removing the barriers to actually getting the book it’s easier for everyone to read. So it’s not like we’re only removing barriers with TV – but we’ve certainly eliminated a lot of them and we’ve made it so easy that many Americans instinctively flip on the TV as they walk into their home. They don’t know what they want to watch but they know that they’ll find something to entertain themselves, even if it doesn’t create any kind of lasting enjoyment. One of the challenges that I have is in being a fan. I struggle to be a fan of anything. I do have favorite artists and experts. However, I seem to be missing the gene that is responsible for converting interest into fanaticism. Having this deficiency makes it hard for me to watch sporting events. I simply don’t care whether the Colts win or lose. For me I don’t feel connected to them. They’re at home in Indianapolis, where I’m at, but otherwise I don’t feel like my interest helps them to win or lose. I don’t believe that I’ll learn something from watching them play that will be valuable – or even interesting – to me. It’s not just football either. It’s auto racing. While I’m interested in some of the drivers that I’ve met, I’m not interested in the race itself. It’s basketball. In Indiana basketball is practically a religion. I can’t bring myself to the alter of basketball. In junior high school I remember vividly an assembly at the beginning of the year. We were all sitting on the bleachers in the gym. The principal made some perfunctory comments about the school, the year, and the students. However, he chose to pull out an album version of Whitney Houston’s song “Greatest Love of All.” I still remember the smoke top on the turntable and the spinning of the record. The lyrics of the song were resonating through me even though the soulful bass wasn’t. In “learning to love oneself” there seemed to be a hidden message to not try to be anyone else. If you love yourself why would you want to be anyone else? You can’t manufacture flow in an assembly line. You can’t follow someone else’s recipe for it. You have to find flow yourself. Flow is about inner life and inner game. It’s about managing emotions and keeping our egos in check. Using someone else’s map on the city that is inside our minds won’t work. Aristotle separated means from ends. However, flow mixes those together into one cohesive form. Flow is autotelic – that is it is its own reward. While you need an object to focus on in order to get into flow. You need something where your skill and challenge are appropriately balanced. However, what that item is doesn’t necessarily change the state of flow. If the state of flow produces happiness in your life doesn’t it then become the goal? However, with flow the goal is always something else. The end is always another thing. It may come with additional mastery of flow but you can’t attempt to master flow directly. Because flow requires a relaxed state you can’t focus on the state itself. (See The Rise of Superman for more.) Flow is seen as the means to the end of greater productivity in some specific area of our life. It is, however, also and perhaps more importantly, the way that we are able to get happiness in our lives too. One of the natural traps that nearly everyone falls into at some point is forgetting what we do for enjoyment and beginning to become more focused on the results of the endeavor. Take, for instance, my review of Platform where I highlighted my challenges with Michael Hyatt. I don’t understand how you can write for you (like I do) and at the same time follow a rigid set of rules about how to write. Somewhere along the line it seems like he got pulled off course from self-discovery towards monetization. I write to force myself to understand things. I’ve said repeatedly over the years that I write my blog for me – not for you. Not that I am not happy that you can find value in the blog. Quite the contrary, it makes me happy to know that I’m helping others. However, that’s not my primary purpose for writing. My primary purpose for writing is to create an object for me to focus my thoughts on. For me the end game is understanding the material deeply. It’s never been to make money from the writings. I use Amazon.com affiliate links for the books that I review because it costs you nothing and can provide some meager income. In truth it doesn’t even pay for my “book habit.” Other than the Amazon.com associates fees I don’t make revenue from this blog. One might quickly say that I get business from the blog. The truth is that I’ve yet to receive any business consulting work through the blog. Whether that is that people just don’t buy like that, my writing isn’t compelling enough, or people don’t like something about me, it is truth. So quite literally I’ll spend more than 10 hours a week working on reading and writing and get nothing from it. So why do I do it? Well, to learn more. Would I love to be making money from my blog posts either directly or through speaking and coaching opportunities? Absolutely. Has it become the end that I’m seeking? Not yet. There are numerous people who have converted their hobbies into their vocations and they’ve loved it. However, there are some where the process of converting their hobby to a vocation robbed them of the joy. This is particularly the case with artists who must bow down to what the client wants rather than to their own internal aesthetic voice. In the Matrix movie series it was exposed that humans were enslaved by the machines and given a perfect virtual world without struggle or challenge. The humans rejected the virtual reality and a new virtual reality was created where the humans “in the matrix” were given a world in which to struggle. It seems like as humans we need to struggle. Without the struggle we lose our will to live. Like the rats in Rat Park who were deprived of anything that makes life worth meaning (See Chasing the Scream for more on Rat Park) humans without challenges lose their zest for life. How Children Succeed talked about the necessity of challenge to instill grit and perseverance. It’s the raw materials for building the skills that we find drive people to the most success – and happiness- in life. When we take away all of the challenges we deprive folks of the things that bring happiness (and frustration) to our lives. If you were to ask me if I fear electricity, I’d answer no. I’ve wired up over 720 single-phase amps in one sitting. I’ve connected two strings of 18 car batteries to power an experimental electric vehicle. I’ve never been afraid of electricity. However, I do have a deep respect for its power and its ability to cause harm. As a result I frequently put in an extra set of safety checks. I monitor more closely when I’m working with large amounts of electrical energy. But I don’t fear it. Strangely as I reflect on the readings about flow it seems like those who can obtain flow easiest are the people who respect the mountain. They respect the snow. They respect the activity that they’re able to achieve flow with. They don’t fear it. They’re not driven by adrenaline – at least they’re not sustained by it. Instead they’re driven for a respect and they’re making decisions on the fly – or seeing possibilities – without paralyzing fear. As I mentioned in my review of The Rise of Superman, there’s a curious thing going on. In flow we’re doing lateral thinking. We’re observing more intently. However, the process was kicked off with a cocktail of neurotransmitters which included adrenaline which is known to narrow our focus. We should be narrowing our focus based on this – not broadening our awareness and our lateral thinking that is demonstrated to be happening. Where things get interesting is when you realize that creativity relies on these long-reach connections, large blocks of lateral thinking, and the ability to simultaneously evaluate a problem from multiple dimensions. At the same time, creativity is shut down by guilt and shame – which are the parts of the brain which get shut off in flow. (See Creative Confidence for guilt and shame’s ability to shut down creativity.) Creativity requires a growth mindset (See Mindset) and the desire to get just a little bit better each day. Flow requires continual growth – with an optimal 4% increase. So given this, what is the relationship between the state of flow and the creativity that the world is seeking more and more? As our society moves to a “creative class” which encompasses over 30% of people today, do we need to create and instill flow for these creatives to be effective? (See Theory U for the quote from Richard Florida.) It seems like the answer is to create more flow in our lives. 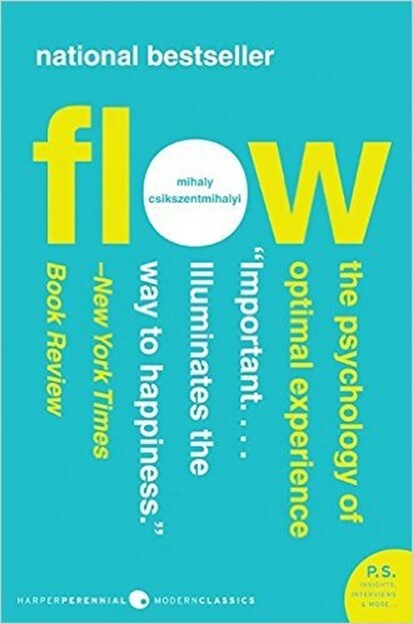 In the end Mihaly Csikszentmihalyi wrote a book about how to be happy and productive – through Flow.